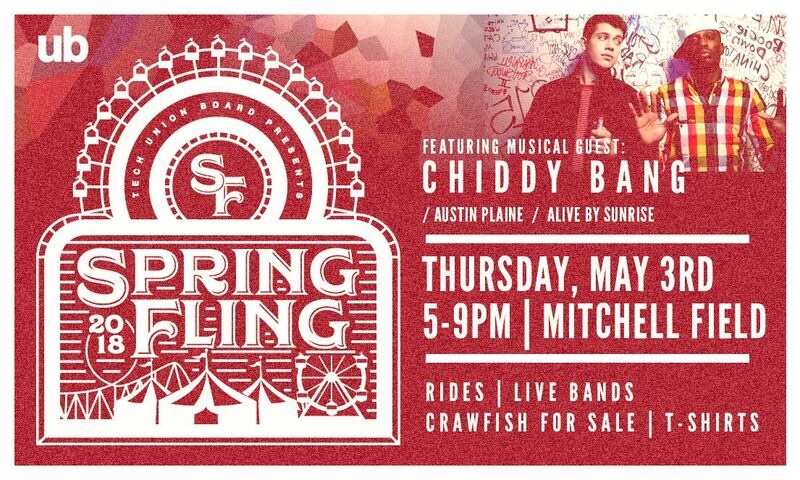 Spring Fling 2019 will be on May 2nd, in the Mitchell intramural fields! The event is free and open to the public, but crawfish plates and t-shirts will be sold for $5 each at the event (cash/card/check). Join us for some awesome live music by Dallas natives D and Chi, Elmont and Shreveport natives Alive by Sunrise! Carnival rides including a ferris wheel and tilt-a-whirl will also be there! Stay tuned for more details, but be assured, this event will have FREE food and FUN! Coming back to Louisiana Tech is Sailesh the Hypnotist! Sailesh is a renowned hypnotist and campus speaker across the United States. The event is free and open to the public and Will be on May 13th, starting at 6pm in the TONK! Check out his website and the clip below to see what this great event is all about! Join us for a showing of Crazy Rich Asians at the Argent Pavilion Parking lot on Feb 13th at 9pm. Bring a car (or lawnchair or blanket!). Free popcorn will be provided! We’re excited to announce one of the best annual events for our students! RusVegas is a night at the casino, except without the risk! Dress up and join us at the Davison Athletic Complex for games like Poker, Blackjack, Roulette, and more! Everyone enters with the same amount of bulldog bucks and earn more for a higher chance to win some great prizes! The event will be February 4th, at 6pm. We will have live music and free food, so make sure to bring a friend! What’s the best way to prove your knowledge? Trivia night of course! 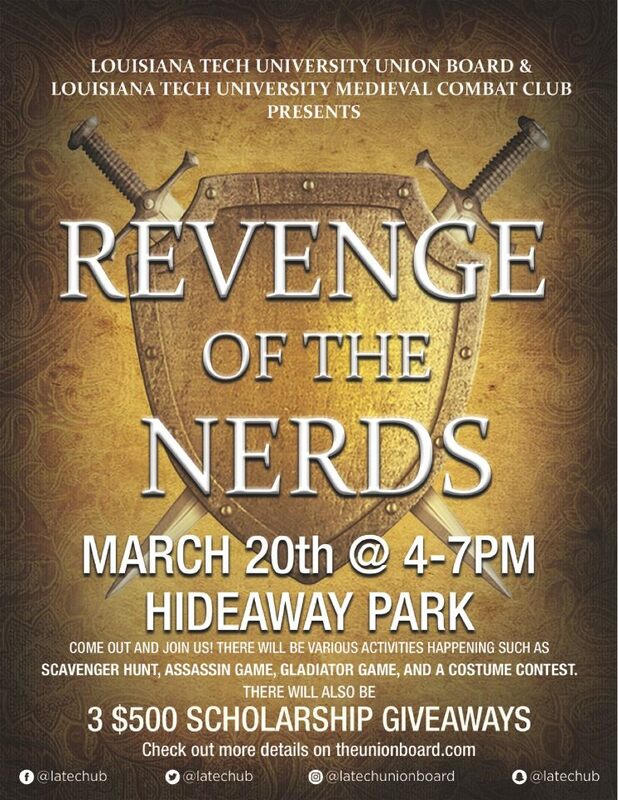 Bring your friends and show your wit and compete to win prizes! This event will be Monday, January 14th, starting at 6pm in the Tonk! Come out for your chance to win a $200 cash prize! UPDATE: LOCATION HAS BEEN CHANGED TO TOLLIVER HALL, NOT TONK!! See you there! Union Board and Res Life are hosting a Christmas Movie Marathon in the Tonk on Dec. 18th starting at 6pm! Free hot chocolate and popcorn will be served! Bring a blanket and some friends and enjoy some great movies! Join us in Howard Auditorium for an amazing night of music and speakers. Rapper KB will be headlining the show, with opening music by Corey Kent White. The event will begin at 8 pm. The event is free and open to the pubic! Join us for the greatest holiday celebration! There will be games, free food and hot chocolate, free photo novelties, and a build-a-bulldog workshop! Santa will also be taking photos at the bookstore! The event will be from 6-9pm in the Tonk in the Student Center! Sam Comroe will be coming to Howard Auditorium on Wednesday, December 5th! Sam was a finalist on this year’s season of America’s Got Talent!!! Don’t miss this opportunity to see some real comedy! The event will begin at 7pm. The event is free and open to the public. Union Board is hosting Frankie Ballard with opener Daniel Smalley on November 9th, 2018!!! The concert will be hosted in Howard auditorium and tickets will be sold on our website! The Miss Louisiana Tech Pageant hosted by Union Board is where judges select the most extraordinary women that represent our campus in the Miss Louisiana Pageant! Check out the Miss Tech page here! Join Union Board on October 31st for our Halloween event, Tech-r-Treat! The festival portion will be at Argent Pavilion by the Joe, and there will also be a haunted trail through Hideaway Park! Many different campus organizations will be participating in the trunk-or-treat portion, and there will be free food, games, and much more! The event is open to all students, faculty, staff, and the general public! Union Board is hosting a drive-in movie on the intramural softball field on Thursday 10/18, starting at 8pm. Bring a car (or don't! ), some friends, and come enjoy a great movie! UB will be providing popcorn as well. Your chance to showcase your hidden talents to the students of Louisiana Tech!! Check out Talent Show here! Curious about how to join Union Board? Or maybe you just want to know what we do and how we do it? Join us at this interest meeting to learn this an much more! Join Union Board for a night of competition! Teams of 7 can compete in a kickball tournament for some great Tech gear! Individuals can compete in in a chicken nugget eating contest for a grand prize of $250! Chicken nuggets will also be served to attendees on a first come first serve basis! See you there! Join us at the organizational browse in the plaza Thursday at 11am-1pm. We will be giving away 500 bags full of back to school supplies! Welcome back bulldogs!!! The Movie will be Avengers: Infinity War. See you there! Want to learn more about our Artists? Click one of the buttons below! THE EVENT WILL BE INSIDE OF HOWARD AUDITORIUM NOT OUTSIDE! Mardi Gras Holiday - No Class!! Join us for this year's Rusvegas! The theme will be Roaring 20's so bring your best/most dapper semi-formal attire! There will be major prizes up for grabs so be sure to arrive by 6pm to give yourself as much time as possible!